Food historians credit China with inventing ice cream and Marco Polo for introducing it to Italy on his return from the Far East. Ice cream is believed to have been invented in China, but it’s taken more than 2,000 years for the Asian powerhouse to warm up to the frosty dessert. Their version of ice cream was made from a soft paste of tender overcooked rice, combined with spices and milk and then packed in snow to solidify. It probably was more of a gritty ice milk and less like today’s smooth ice cream. China is now the world’s biggest ice cream market, with sales estimated at 4.3 billion litres in 2016. Half (49%) of urban Chinese consumers eat ice cream at home as a snack, compared to four in 10 (39%) who said the same in 2015. The Chinese word for this cold tread so loved worldwide is an interesting combination of a Chinese stem and a loan word. Bing is the Chinese word for ‘ice’. The jiling part has entered Mandarin from Cantonese, where it is pronounced something like ‘keeling’ or ‘keelam’, which is a local rendering of the English word ‘cream’. One third of all ice cream bought globally is consumed in China, which became the largest ice cream market in the world in 2014, beating the US by a lick with USD 11.4 bn in sales compared with USD 11.2 bn. Chinese people spent 54% more on ice cream in 2014 than they did five years earlier, while the US market managed a more tepid 6.6% growth. However, Americans retained their crown as the most gluttonous ice cream consumers in the world, consuming 18.4 litres of the dairy dessert per capita in a year – more than four times more than the average Chinese person’s annual intake. Rising incomes are driving the growth in China’s ice cream market, helped by the country’s increasingly developed retail infrastructure and facilities for storing and supplying “cool cargo” such as fresh produce, frozen foods and pharmaceutical drugs. The pace of development, coupled with the immensity of the population, is having an increasing impact on the Chinese ice cream market. However, the vast array of locally produced, low-price brands present a challenge for global ice cream giants looking to develop there. 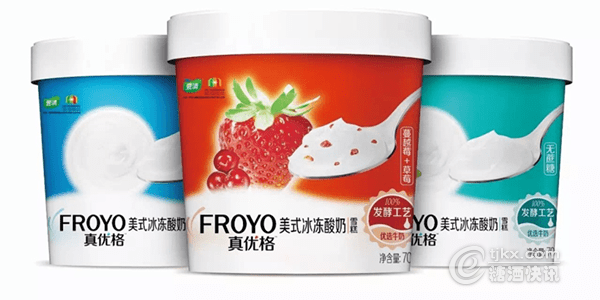 Top Chinese dairy company Mengniu recently launched China’s first yoghurt ice cream. Just two non-Chinese companies make the list of the country’s 10 most popular ice cream brands. Unilever, which owns Wall’s and Ben & Jerry’s, is the fourth biggest company in China with around 3% of the market, while Nestlé holds 1%. The following table shows the production of ice cream in China in 2017, broken down in major administrative region. As is the case with many statistics like these, it is useful to also look at the total figure of the cities Beijing and Tianjin and Hebei province, that are geographically one region. 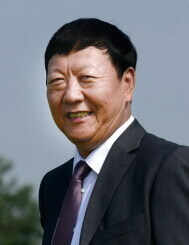 The Chinese government is currently conceiving a development plan to (re)integrate those regions. The total volume for ‘Greater Hebei’ would then be 402,360, making it China’s 3rd ice cream region. Ice cream makers have adopted the products they market in China to the Chinese palate. Most Nestlé Ice cream has a different flavor than in its Western markets. Not as rich or sweet. For the most part at a Chinese Buffet you can find the typical frozen Ice Cream sections for scooping: chocolate, milk/vanilla, strawberry. Then you have red bean (see photo), taro, green tea, sesame seed, green bean, ginger or red date. 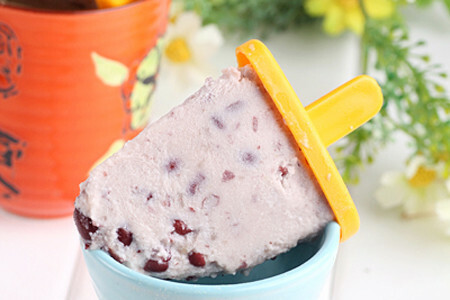 There is a plethora of fruits in China like longan, lychee, durian, etc., which can all be used to flavour ice cream. Smaller local companies try to experiment with odd flavours, like: ‘sweet green pea’ and ‘tomato-strawberry’ popsicles, to lure consumers away from the major brands. A number of local players has started experimenting with flavours inspired by traditional Chinese cuisine. Wufeng introduced a spicy chocolate flavoured ice cream called Mengxiaola in 2016. Moreover, an ice cream store called Global has squid ink flavour and other unique flavours from across the world. Yolk ice cream can be found in Bonus, a Chinese ice cream store in Shanghai. These are all newly invented flavours and consumers are keen on trying them. On a widely used restaurants review and recommendation app called Dianping, Global scored 8.3 on a scale from 1 to 10 in terms of its flavours, which is a pretty high mark. 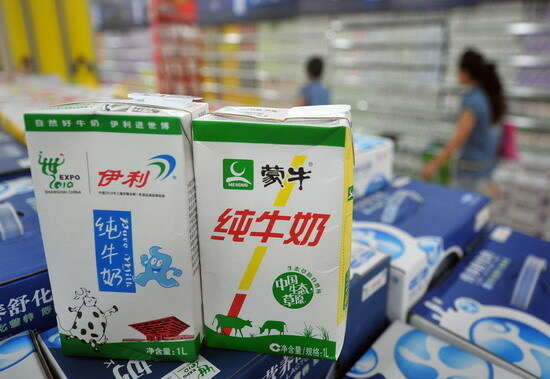 Fonterra’s Tip Top ice cream started to be sold on trial through Tmall in June 2016. one of China’s leading e-commerce providers, operated by Alibaba Group. Distribution will be handled by specialist frozen products distributor Zhuhai Ice Technology. 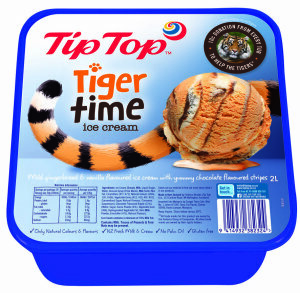 It is still too early to report on the launch’s success, but I expect that Chinese consumers will be attracted by the icecream shown this picture, as the tiger is a symbol of strength and energy in Chinese culture. The Chinese ice cream market is now so developed, that it is drawing the interest of international chefs. 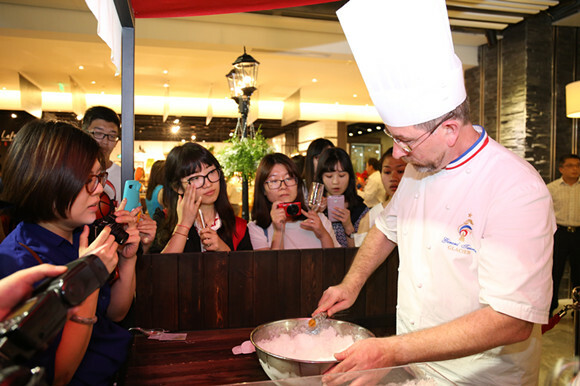 French chef Gerard Taurin, a pastry chef from Normandy, offered his latest creation at Beijing Galeries Lafayette in June 2015. Most of his ice cream is made with unusual, but very Chinese, ingredients, such as jasmine, goji berries, ginger and Sichuan peppers. Taurin’s selection comprises 10 flavours, including black sesame, tapioca pearl, hawthorn fruit, millet, jujube, cinnamon and eucalyptus. His ingredients are inspired by his travels to Beijing, Hebei, Shanxi and Sichuan provinces. He has shared his ice cream with people on the Great Wall, in the Forbidden City and in Beijing’s hutong alleyways to see how Chinese consumers react to his creations. All these innovative products have pushed away older ice creams that used to be produced in the early days of the PRC. This has created a craving among older consumers for flavours from the good old days. I have reported on the return of old brands in previous posts. 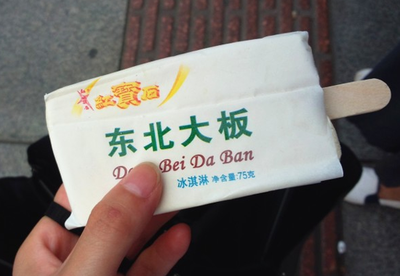 One local company in Heilongjiang province has launched Dongbei Daban ice cream,playing the nostalgia card to promote its ice cream. Dongbei uses 1980s style packaging to wrap the same simple shaped cones designed from that era. For older customers, this brings back memories of their childhood. Considering that China has the largest occurrence of diabetes in the world and that obesity is also on the increase, an increasing number of people are calling for healthy or low-fat diets, which facilitates the creation of new ice cream types. Noticeably, frozen yogurt has also become a popular choice in China. The probiotics found in frozen yogurt help conserve some of the nutritional value in ice cream, which is conducive to maintaining beauty, slimming, and digestion. Another example is the “one egg” ice cream introduced by Deshi in 2016. The special ‘’egg + oats’’ ingredients drew a significant amount of attention. Astoundingly, the average daily sales volume of “one egg’’ (see photo) was 2 million in Northeast China in the beginning of 2017. As Chinese are putting more focus on experience as opposed to the food itself, ice cream is no longer just seen as a mere treat, but as a product of a modern life style. In traditional Chinese mind-sets, eating very cold food is perceived as adverse to health. However, the considerable impact of Western ice cream has changed perceptions. 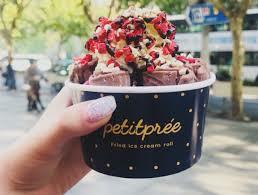 Nowadays, DIY experience ice cream stores is a new strategy to cater to the requirement of customers. Nestlé, Yili , and the Japanese brand Meiji have together invested over RMB 1 billion for developing new ice cream projects in 2016 to win more shares on the market. 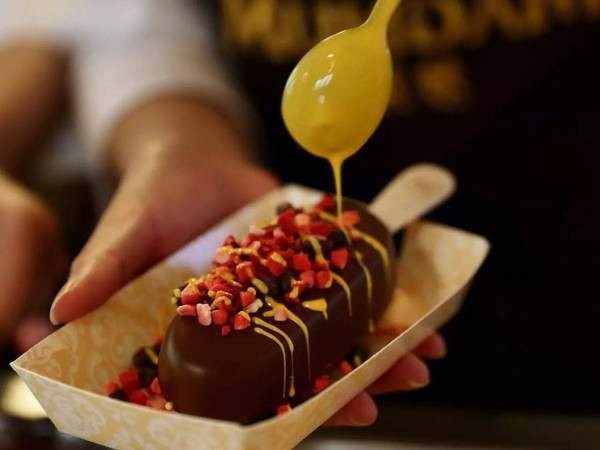 In May 2017, Magnum reopened its DIY experience shop called “Pleasure Store” in K11 Shopping and Art Center, Shanghai for the third time, which rekindled the enthusiasm of many ice cream lovers. In other cities like Nanjing, Beijing, Chengdu, Pleasure Store also left footprints in the busiest commercial districts like respectively Jinmaohui , Sanlitun and Taiguli in the last two years. The DIY experience does not only endow ice cream with higher value, but also strengthens the ice cream brand and customers relationship. The best evidence of the money (urban) Chinese are willing to pay for high-end icecream is Prée that opened its doors in Shanghai’s expensive entertainment quarter Xintiandi. This new high-end ice cream lounge claims to use “smart technology” and alleged recipies from “a very low profile three-star Michelin chef”. The cream gets made fresh on site, with black truffles, bourbon, roasted cherries, and other pieces of luxury. The name is said to have been derived from a popular ice cream shop owner in a small Swiss town, on a street called Ai Prée. The owner, this mystery Michelin man, only uses traditional recipes combined with advanced ice-cream technology, the PacoJet. With prices ranging from RMB 42 to 88 for a dressed up ones-scoop cup, it is the most expensive icecream parlour in China, but the customers are raving about the experience. Prée opened a subsidiary in Hangzhou mid 2018. Ice cream is now big business in China and in particular so for the suppliers of a broad range of ingredients: flavours, sweeteners, emulsifiers, thickeners, etc. This generates a more than enough critical mass for a dedicated trade fair. CICE 2015 – The 11th China International Ice Cream Industry Exhibition will be held in Beijing, April 16-18, 2015. Here, I will only copy the ingredients part of the published scope of this exhibition: specific herbs, flavors and fragrance for ice cream, compound dairy stabilizer for ice cream, natural coloring materials, diet coloring materials, sweetening substances, lactic acid bacteria, specialized & condensed milk essence, special ice cream protein powder & bean powder, other supplements include potato powder, malt essence, fresh cream, dried cheese element, primary dairy products, dairy purification powder, natural fruit powder, chocolate plate, coffee bean, coffee powder, coco fat substitute, nuts, dried fruit. However, the brand has 380 stores in 84 cities in the country, despite the challenges at markets in second and third tier cities in the country. The company reports it still maintains strong growth in large cities. Revenues in Shanghai and Beijing grew 16% and 13% respectively in June 2016, and it opened more than 60 new stores as well in 2015. Insiders believe that the slowdown is partly due to rising rental and labour costs, which have made it become more conservative regarding expansion. Haagen-Dazs also faces intense competition from many other food service players. Many cafes and coffee shops outperformed Haagen-Dazs thanks to their sophisticated dining environment and rich product availability. The authoritative magazine for the Chinese flavour industry ‘Domestic and Overseas Aromachemical Information (Guoneiwai Xianghua Xinxi)’ of June 2016 carries an interesting article on possible new ice cream flavours, based on ideas collected from all over the globe. I will list the flavours mentioned here. Ice cream flavoured with a tincture of bacon, adding a little caramel, to obtain a proper salty-sweet balance. An idea from Ireland, reported best in combination with dark chocolate. Chili and chocolate already has become an accepted combination, so why not try it in ice cream? Some Mexicans in the US flavour their ice cream with Tabasco. Perhaps Laoganma can get involved in this project. The origin of the flavour is closer: Japan. The taste sensation of celery ice cream is reported to be close to that of wasabi. I have actually tasted this one of my favourite eateries in Amsterdam: the Garlic Queen. It is also a must-eat during the Gilroy Garlic Festival. Chinese are big garlic eaters, so garlic ice cream should have a market there. Last but certainly not least, Tradition Chinese Medicine (TCM) includes a number of herbs that could be used in ice cream. No one would object to turning such a delicacy into a health food. These ideas provide a rare insight in what Chinese food technologists are thinking about developing new types of ice cream. I will keep you informed about which of these flavours will be turned into a commercial product. Russian ice cream has been rapidly gaining popularity in China during the past couple of years. Particularly in vogue are the products of IceBerry and sold in Qing-Feng Steamed Buns (mantou) Shops. 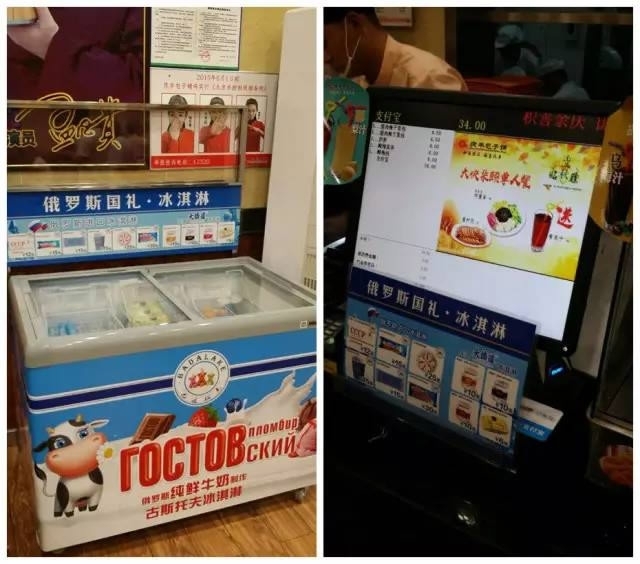 The photo shows a freezer containing the ice creams was labelled “Russia’s national gift”－a phrase which refers to Russian President Vladimir Putin, who brought a few boxes of that as gift for his Chinese counterpart Xi Jinping when they met on the side lines of the G20 Hangzhou Summit in east China’s Zhejiang Province. Some Chinese media are referring to this as ‘ice cream diplomacy”. The ice cream is priced between RMB 6 to 30, and each store sells an average of 300 ice creams a day. According to Roman Lola, the CEO of IceBerry, the company plans to export 500 mt of ice cream to China in 2017. It will not be an easy trip for the ice cream to travel from Russia to China, as the chilly dessert needs to be moved within a temperature-controlled supply chain. “Compared to high-end ice cream brands in Europe and the US, the Russian ice cream has an obviously benefit on price,” said Wang Xianzhe, a company manager focusing on Russian food imports in China. “The good quality and affordable price, let alone President Putin’s advertising effect, all support the Russian ice cream catching on in China.” IceBerry’s ice cream is reportedly made from high quality milk from the Ural and contains no preservatives or other artificial additives. The Russian export of ice cream to China in 2017 was worth USD 2.7 mln; up 13%.